A solar heating system uses solar collectors to absorb the sun's radiation as heat. Solar thermal energy is used for domestic water heating, swimming pool heating or industrial water heating. It is a completely renewable source produced directly from sunlight and once installed, produces no carbon at all. Solar Thermal energy systems are a versatile and truly renewable energy solution that can be used to dock into or assist existing renewable energy systems and/or help to reduce a property's emissions. The science behind Solar Thermal systems is extremely simple. Sunlight falls on a flat plate or tube collector and heats up a fluid that transfers the energy to the heating system heating and/or hot water systems inside the home or swimming pool. Isoenergy install both Flat Plate and Evacuated Tube collectors. Flat plate collectors consist of a dark flat-plate absorber of solar energy, a transparent cover that allows solar energy to pass through but reduces heat losses, a heat-transport fluid (air, antifreeze or water) to remove heat from the absorber, and a heat insulating backing. Evacuated tubes use heat pipes for their core instead of passing liquid directly through them. These collectors are composed of multiple evacuated glass tubes each containing an absorber plate fused to a heat pipe. The heat from the hot end of the heat pipes is conducted to the transfer fluid, typically propylene glycol, and circulated to a domestic hot water tank heat exchanger and/ or hydronic space heating system. 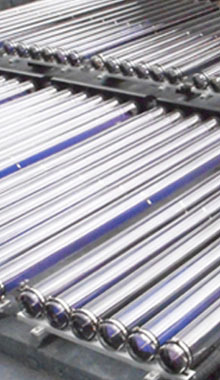 The vacuum that surrounds the outside of the tube greatly reduces convection and conduction heat loss to the outside, therefore achieving greater efficiency than flat-plate collectors, especially in colder conditions. This advantage is largely lost in warmer climates, except in those cases where very hot water is desirable, for example commercial process water. The high temperatures that can occur may require specially designed systems to avoid or mitigate overheating conditions. Domestic solar thermal systems can be installed as part of a new build but they can also be integrated easily with your existing hot water system with the installation of a new hot water tank. Systems have a typical life expectancy of 25 years and will function automatically with minimal maintenance. Using a solar heating system to heat your radiators or your under-floor heating system is an option, but we would not recommended it in the UK. The relatively low levels of solar radiation available during the winter severely limit the contribution a sensibly sized solar thermal panel system can make. If you increase the area of solar panels you install you will get a lot of energy in the summer that is wasted. A solar water heating system can be used to heat a swimming pool. A system can be sized to warm a small domestic pool, an Olympic-size public pool or anything in between. If you only use your pool during the summer a solar thermal system can provide a large amount of the heating demand, providing the weather is sunny. If you have an indoor pool that is used all year the solar thermal collectors can provide up to 60% of the annual energy demand, with the remainder provided by a standard boiler, electric heater or ground source heat pump etc. We typically recommend flat plate collectors for pool heating. The use of more expensive vacuum tube collectors is not required given the relatively low operating temperatures. Solar thermal systems transfer heat from sunlight to a heat transfer fluid which in turn heats domestic hot water and can preheat the central heating. There are two main types of solar panel: flat plates, and solar tubes. 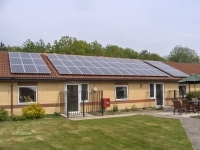 Flat plates are cheaper but solar tubes are more efficient when the heat generated is to be used for domestic hot water. Just as with solar photovoltaic panels, it is best if solar thermal panels are inclined at about 40o – 50o above the horizontal and face south. You will need a suitably sized roof area that is strong enough to take the weight of the panels. 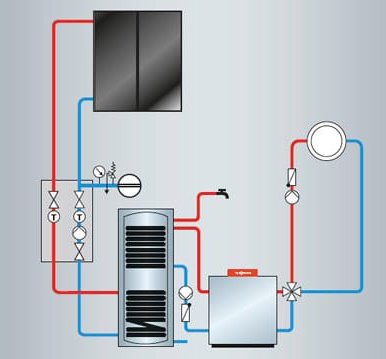 It is necessary that suitable hot water cylinders and systems are installed that are compatible with a solar system. So you may need a new and perhaps bigger hot water cylinder than you have at present. To make the most effective use of solar energy it is preferable if the peak demand for hot water is shifted from the mornings, when there is little sun to replenish the system and it is likely that a boiler or heat pump will recharge the hot water as it is run off, to the afternoon or evening when it is possible for the sun to do the work. It is seldom practical to size a solar system so that it covers the hot water demand of a property during the winter when the solar thermal system is at its least effective. If we do that then there is the likelihood that there will be something like a five times over capacity of energy that needs to be disposed of in the summer. A possible exception to this rule is where there is an outdoor pool available that may be able to absorb the excess energy during the summer. As a rule of thumb it is typically possible for a solar thermal system to cover most of the hot water load in the summer but much less in winter. If the system is suitably designed it can make worthwhile contributions to heating in the spring and autumn seasons. It is always essential to make sure that the system is designed to handle the maximum solar energy supply on a sunny day in mid-summer when the demand is low (for example during a holiday period). With the coming of the renewable heat incentive and some substantial government subsidies for solar thermal systems a solar system can be cost effective and is one of the options that is almost entirely renewable.